The U.S. Geological Survey, in cooperation with the South Carolina Sea Grant Consortium, conducted a 7-year, multidisciplinary study of coastal erosion in northeastern South Carolina. Shoreline behavior along the coast of Long Bay is dictated by waves, tidal currents, and sediment supply that act within the overall constraints of the regional geologic setting. Beaches are thin ribbons of sand that sit on top of layered sedimentary rocks, which have been deeply eroded by rivers and coastal processes over millions of years. Offshore of the beaches, these sedimentary rocks are exposed as hardgrounds over large expanses of shallow seafloor and are locally overlain by a discontinuous veneer of sandy sediment generally less than 1 m thick. Rates of shoreline retreat largely depend on the geologic framework of the shoreface that is being excavated by ocean processes. Mainland-attached beaches have remained relatively stable, whereas barrier islands have experienced large shifts in shoreline position. In this sediment-limited region, erosion of the shoreface and inner shelf probably contributes a significant amount of new material to the beach system. Oceanographic studies and numerical modeling show that sediment transport varies along the coast, depending on the type and travel path of storms that impact Long Bay, but the long-term net transport direction is generally from north to south. Changes in storm activity that might accompany climate change, coupled with anticipated increases in sea-level rise, are expected to strongly affect low-lying, heavily developed areas of the coast. Barnhardt, W.A. (ed. 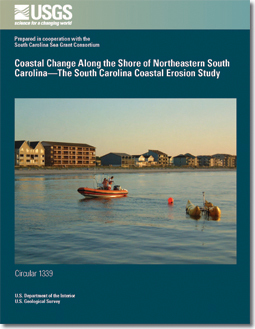 ), 2009, Coastal change along the shore of northeastern South Carolina—the South Carolina Coastal Erosion Study: U.S. Geological Survey Circular 1339, 77 p.